Lieut.-Colonel W.R. Gilbert's bungalow at Sambalpur (Orissa). bl.uk > Online Gallery Home	> Online exhibitions	> Asia, Pacific and Africa Collections	> Lieut.-Colonel W.R. Gilbert's bungalow at Sambalpur (Orissa). The town of Sambalpur is located in the district of the same name, situated on the western edge of Orissa near the border with Madhya Pradesh. The name derives from its presiding goddess Samalei, enshrined in the Samalai Gudi temple on the Mahanadi River. The area has been inhabited since the 4th century by several different dynasties and was annexed by the British in the early 19th century. 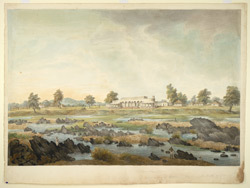 This drawing shows the bungalow on the banks of the Mahanadi River with hills in distance and the river with rocky bed in the foreground.